Are you looking for a sweet and delicious snack that isn't packed full of calories? Are you trying to watch your weight or lose weight without giving up dessert? If you answered yes, to one or both of these questions, then you are going to love Vitalicious! 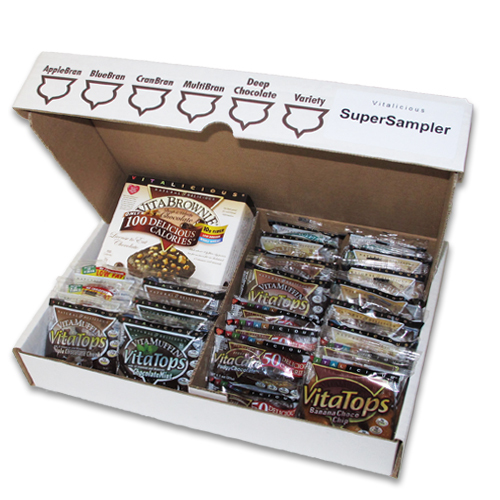 I recently had the opportunity to give the Vitalicious Super Sampler Pack my full attention. It was loaded with goodies in a variety of flavors. It included a variety of all natural, fiber-packed muffin tops and brownies. Each containing only 50-100 calories each. All is takes to "walk off" one of these delicious and healthy snacks is approximately 7 - 15 minutes! I was super excited when my Vitalicious Super Sampler Pack arrived. I immediately opened the box and looked inside. I was amazed at the content variety and how many items were inside. So many yummy treats! Where was I going to start? As per the instructions, I put the entire box into the freezer when they arrived. Vitalicious VitaTops are Kosher and contain no artificial additives or preservatives. Therefore they must be frozen in order to preserve their full freshness. I'll be honest with you, even though I was super excited to give them a try, I was also a little skeptical. After all, I've tried numerous 100 calorie snacks that tasted like air and cardboard. While others tasted good, they were so tiny that I felt like I had ate nothing at all. The very first VitaTops I tried was the Triple Chocolate Chunk! Chocolate has always been my weakness, so it was the obvious choice for me. ﻿I ate the muffin top for breakfast and I wasn't hungry the rest of the morning. I was pleasantly surprised, I was full through lunch. I'm going to say that the Low Fat Triple Chocolate Chunk VitaTops and the Low Fat Fudgy Peanut Butter Chip VitaTops are my favorites. They taste so good that you'll totally forget that they are healthy! I love the fact that I can pull them right out of the freezer and warm them up for a few seconds in the microwave. I also love the fact that I can take one right from the freezer and put it in my purse or my hubby's lunch box and it will be ready to eat in about 1/2 hour. Perfect for at home or while on-the-go! I think it's safe to say that Vitalicious VitaTops are perfect for the entire family. My kids loved them as much as I did! From VitaTops to VitaMuffins to VitaCakes to VitaMixes. They are perfect for a snack, breakfast and even dessert. You can indulge yourself with one of these sweet treats and not feel guilty afterwards. You simply can't go wrong. Finally, a "muffin top" that I actually enjoy having! This giveaway will end March 29th at Midnight EST. Disclaimer: I received a complimentary Vitalicious Super Sampler Pack for the purpose of writing a review and hosting a giveaway. Regardless, I only recommend products or services I use personally and/or believe will be a good fit for my readers. The views and opinions expressed on this blog are purely my own. Results may vary. No monetary compensation was received. i wanna try bananaa nut! I would like to try their Fudgy Chocolate mini VitaCakes. I would like to try the apple crumb. The Apple Crumb would be tasty! Dark Chocolate Pomegranate VitaBrownies are my choice! I love all of their treats, but especially SF velvety chocolate! I'd love to try the Banana Nut VitaTops! Oh I would love to try the Carrot Cake VitaTops! I want to try the vita pizzas! 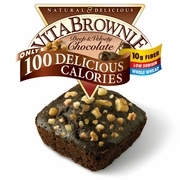 Deep&Velvety Chocolate VitaBrownies sound yummy! I would like to try the banana nut Vitatops. The Vita Pizza looks really good! I would like to try the Dark Chocolate Pomegranate VitaBrownies! cheese and tomato vita pizza! 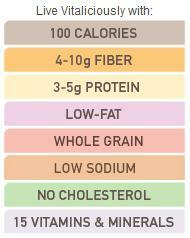 I would love to try the BlueBran VitaMuffins! The Dark Chocolate Pomegranate VitaBrownies sound like heaven!